Do you want to learn how to use Adobe Lightroom? Learn how to retouch high key color portraits with a white background in this Adobe Lightroom tutorial. I take you step by step in this tutorial from global adjustment to local adjustments that give your portraits that professional look. Do you want to get started in photography? Check out the links below to everything you need to get started. While your at it, don't forget to pick up Adobe Lightroom. Purchasing through my provided Amazon affiliate links is a great way to help support my channel. 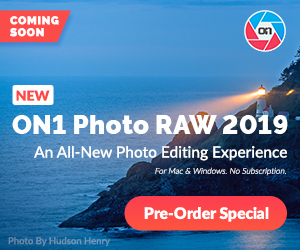 I just wanted to give everyone a heads up that Adobe would be supporting the new Dual Pixel Raw format in the Canon EOS 5D mark IV DSLR Camera. I thought I would do a video on what photography software I use on my Apple Mac for my day to day retouching. I know I teach how to use a number of different applications. But in this video I talk about which ones I prefer to use and why I may not use other programs that appear just as great. The Canon EOS 5D mark IV has been officially announced and brings many expected upgrades including 4K video and a all new 30MP "Dual Pixel" sensor that can even let the photographer do micro focus adjustments after the photo is already taken. So in this vlog I go over the official information and give you my quick thoughts. Are you looking to learn how to take photos like a professional? In this lighting tutorial I show you how to take high key portraits and how to correctly expose your white background to get amazing results each time. Are you looking to improve the quality of you video in Final Cut Pro X? In this video tutorial I step you through some of the color correction techniques I use to correct skin tones, plus also improving exposure, contrast & sharpness in your video. With the upcoming release of the all new EOS 5D mark IV, Canon has also been making sure it has lenses that can handle the high standards this camera bring. They are refreshing the EF 16-35mm f/2.8L and the EF 24-105mm f/4L. Of which many of us have been waiting for a update to the 24-105 for quiet some time. Well everyone I think we finally got all the rumored information sorted out that we are going to get on the all new Canon 5D mark IV until its actually going to be released this week. But in this video I do have some updated information on the new dual pixel sensor and what its uses may be. Are you looking to learn how to use you new Canon 80D DSLR Camera? In this tutorial I show you how you can have separate focusing point potions for both your landscape and portrait oriented shots. New Samyang lenses with Autofocus! Thats right, introducing the newly designed 50mm f/1.4 and 14mm f/2.8 lenses for Sony E-Mount. These full frame lenses are part of Samyang's effort to get into more modern lens design. For those who may not know, Samyang is a South Korean lens manufacture and also go by Rokinon in the USA. Nikon has just announced its latest addition to their entry level DSLR line, the Nikon D3400. So what is so special about this digital camera and what are the upgrades over the model it is replacing, the D3300. So lets take a look at this camera. In this vlog we take another look at the rumored new spec's of the Canon EOS 5D mark IV, but this time we now have a reliable source for the leaked information and information that states the new 30MP sensor in the 5D is actually technically a 60MP sensor..
Are you looking to learn how to use Final Cut Pro X? In this video tutorial I show you how to create multi-cam video projects by combining and syncing multiple audio and video clips together into one easy to use file. Are you looking for a amazing studio microphone at an affordable price? The Audio-Technica AT2035 Studio Microphone is a large diaphragm cardioid condenser mic that offers outstanding sound quality with warm tones that is perfect for podcasting and voice overs. With the Canon 5D mark IV getting closer and closer to being announced. The rumors are running wild on what the specifications will be. In this video blog we take a look at some of the information that has leaked and I give my opinion on those spec's. Does Canon's new picture styles confuse you, or do you just not fully understand them. In this tutorial I will explain and demonstrate how adjusting these parameters can effect both your photos and video. In addition I will share my configuration settings for best video. Do you own the Canon EOS 80D and are wanting to learn how to tether your new DSLR into Adobe Lightroom? In this tutorial I will walk you through step by step on everything you need to know from what cable you will need, how to hook up your camera and how to setup Lightroom to get you tethered! Looking for one of the best portable soft boxes on the market? In this gear review we take a look at the Neewer 16" Portable Round Softbox that fits on any speedlite and is ideal for both portrait and product photography alike. Are you looking to learn how to use the Canon EOS 80D? In these video tutorials I step you through many of the functions and settings used in this camera. In this video I show you how to setup HDR video mode so you can start recording your own high-dynamic-range movies. In this video I try my best to answer some of my viewers burning questions about photo gear. I also talk about possibly doing some Lightroom retouching videos with photos from my viewers.